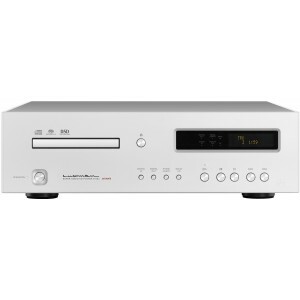 Luxman D-06u SACD CD Player with USB DAC is a good match for L-507uxII, L-550AXII or L-590AXII amplifiers. Earn 6499 loyalty points when you order this item. Luxman D-06u succeeding the magnificent configuration of our flagship model, D-08u, is a CD/SACD player that plays backfile sound sources by connecting to a Windows or Mac PC via USB. LxDTM, Luxman's original disc drive mechanism with overwhelming rigidity and high reading accuracy is provided to stabilise the rotation system at disc media playback, and the latest high sound quality configuration including 32-bit digital signal processor is provided in the digital circuit. The leading-edge USB D/A converter is provided to support 384 kHz/32-bit PCM and 5.64 MHz DSD, for-seeing the further progress of file sound sources. With the enhanced charm as "Digital Media Player", D-06u proposes a new style to play back the music. D-06u is equipped with dual-configured (monaural mode) PCM1792A D/A converter that has achieved ultra-high S/N ratio and dynamic range (theoretical value: 132 dB) manufactured by Texas Instruments Incorporated to support playback of not only CDs and SACDs but also file sound sources of up to 384 kHz/32-bit PCM data and DSD data (2.82 M, 5.64 MHz) by connecting a Windows or Mac PC via USB. TAS3152, the latest 32-bit digital signal processor manufactured by Texas Instruments Incorporated, upsamples PCM signals to up to 384 kHz to polish the sound quality. Thanks to the function of the chip mentioned above, a digital filter is selectable from 3 types for PCM signals, and a tone is selectable from 2 types made by the DAC chip-embedded analog FIR filter for DSD signals. As countermeasures against jitter, the jitter of USB signals is reduced by the dedicated DSP via asynchronous communication, the jitter of CD or S/PDIF signals is reduced by the embedded DAIR high-precision clock, and the jitter of SACD signals is reduced by the dedicated jitter reduction chip. In addition, the low phase noise clock module improves the accuracy of the entire signal transmission. A high-grade analog amplification circuit is necessary to convert playback signals that have been precisely read by the drive mechanism and sophisticatedly digitized into analog signals through the highly precise D/A converter and produce high-quality audio signals finally by the player. D-06u makes the differential output of the D/A converter, PCM1792A, operating at the monaural mode reduce the impedance by the high sound quality buffer circuit with thoroughly balanced configuration (identically configured amplifier x 4 units). This unit powerfully drives the next stage components such as a pre-main amplifier and a control amplifier. The high-inertia power supply system through the regulators and block capacitor with large capacity allocated for each circuit powerfully supports stable operation with sufficient power from Luxman's traditional audio-specific power transformer. PCM digital input terminals consisting of 1 channel of coaxial line capable of up to 192 kHz/24 bits and 1 channel of the optical line as well as USB port ready for DSD/PCM signals on the rear panel. This unit, therefore, can be a digital center connecting to various digital sources. D-06u is equipped with LxDTM, LUXMAN original high-rigidity disc drive mechanism. The box chassis structure that covers the entire base section storing the traverse allows external vibrations to be rigidly blocked out and enables reading digital signals with sufficient accuracy. This mechanism has adopted an asymmetrical left-sided mechanism layout after careful consideration of sufficient space for a voluminous analog circuit, ideal flow for all kinds of signals, oscillatory path, and weight balance without the use of general type centered mechanism structure. Thick die-cast aluminum is used for the loader on which a disc is put. Use of this loader can fundamentally eliminate unnecessary resonance and vibration that are applied to the loader and provide quiet and smooth operation. Gradation cast-iron legs are used to prevent resonance thanks to its characteristics that the metallic structure becomes smaller from the center to the periphery of the leg to suppress external vibration transmitted from the contact area and unnecessary vibration generated in the cabinet itself. The aluminum-made dedicated remote control is supplied for comfortable operation while you are in an ideal listening position. This remote control is a slim type comfortably fit in your hand, yet, has ten keys, and is excellent in operability.